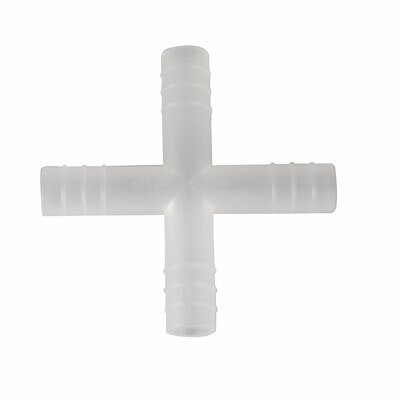 Polypropylene (natural) Y connectors are available in 5 sizes. Size listed indicates the I.D. of tubing the connector is meant to fit. Polypropylene (natural) or Polyethylene (black) are available in 5 sizes. Size listed indicates the I.D. of tubing the connector is meant to fit. Size listed indicates the I.D. of tubing the connector is meant to fit. Polypropylene (natural) or Polyethylene (black) are available in 5 sizes. Size listed indicates the I.D. of tubing the connector is meant to fit. 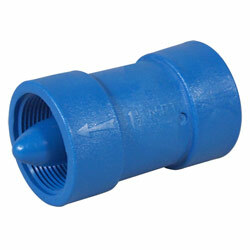 Please inquire for male/barb adapters in polypropylene, polyethylene or brass. These are typically used with small diameter hoses for water, fluids, and certain chemicals where metal materials are not preferred. The White Nylon are made from non-toxic NSF 61 food grade raw materials, but are not considered NSF Certified finished goods and therefore may not be recommended for use in all types of Food or Beverage systems. As a guide only, the White Nylon are rated for pressures up to 150 psi at 20°C (70°F) at ambient room temperatures. The maximum temperature range for White Nylon is 80°C (175°F). 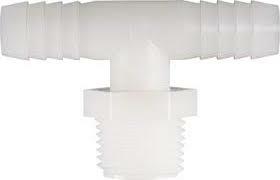 Polyethylene, 3 sizes to fit tubing from 1/8″ to 1/2″ I.D.. All sizes are interchangeable to make reducing combinations. 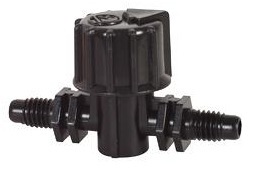 Consists of 2 serrated connectors, which assemble tightly together with a male-female center taper. Available by the roll or by the foot. Non-toxic. Larger sizes are also available please inquire. Synthetic reinforced clear food grade tubing preferred for its kink resistance, high pressure rating and flexibility. 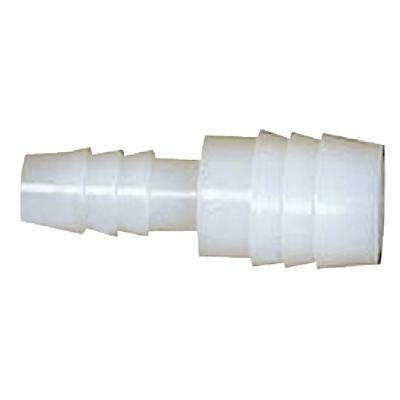 Tough flexible, polyvinyl tubing has excellent clarity, is odorless and non-toxic. 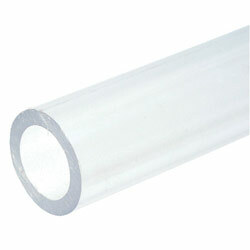 This is a thin walled (only 0.020″ to 0.030″ thick), rigid tubing. Sold in 12″, 24″ or 36″ lengths. If you need to see what is going on inside your pipes, this clear (slight blue tint) PVC pipe is the answer. Use economical short lengths to see the degree of microbial growth inside the piping or build entire clear systems for research, prototypes, oxygen saturators, etc. This clear PVC pipe is FDA-approved for food contact applications. May be cold-sterilized in ethylene oxide. 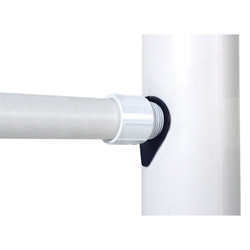 It is fully compatible with regular Schedule 40 PVC pipe fittings. Install with regular PVC cement. Use compression couplings, flexible couplings or unions to facilitate cleaning. Sold by the foot, 10′ length maximum. Lengths over 5′ ship UPS Oversize, over 6′ ship via motor freight. Cutting charge is $1.25 per cut. These handy cutters are great for cutting vinyl tubing, rubber hose, polyethylene and other soft materials. Will cut up to 1″ outside diameter tubing. Replacement blades are also available. *50 Feet Per Roll - May not be one continuous piece. The low friction properties of high Density Polyethylene allows for easy turning of key, which requires no lubricant, thus eliminating blockage of the pores with grease. 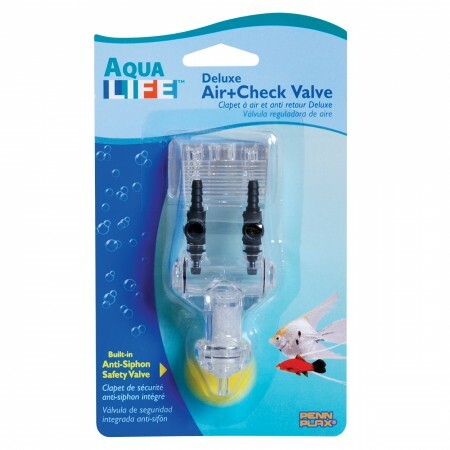 For use with aquarium tubing (3/16″ ID). 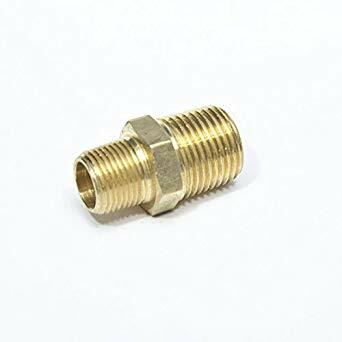 1/8″ male pipe thread. Inexpensive plastic will not corrode. 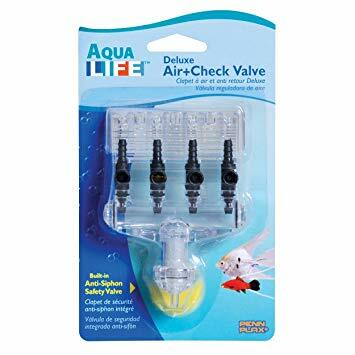 For use with aquarium tubing (3/16″ ID). 1/8″ male pipe thread. 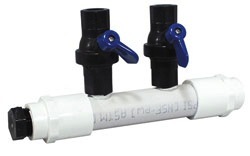 These 1/2" PVC air manifolds are made with your choice of valves. 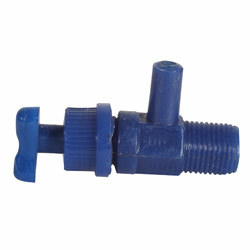 The air supply inlet is a 1/2" FNPT with 1/4" barb (62014) which fits 1/4" I.D. tubing. Plastic valves are VPL1, brass are VBR1, which fit 3/16" I.D. tubing. 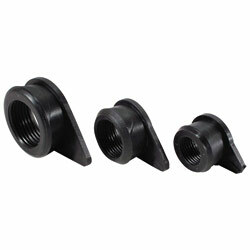 Each manifold includes two 1/2" Clic fittings for mounting to a flat surface. These valve manifolds will save you time and aggravation. They are made with quarter-turn valves. The manifold ports are 1/2" FNPT and a 1/2" FNPT plug is included. Each valve is 1/4" FNPT. Each valve will pass 0.5 gpm with less than 1 psi pressure loss. They also make excellent manifolds for air distribution. The 1/2" threaded plug may be removed for another connection. Top-quality gang valves with visual flow indicator. Stays where you set it. With an extra input/output connection. Fits 3/16" aquarium tubing. Plastic mounting bracket hangs on tank. 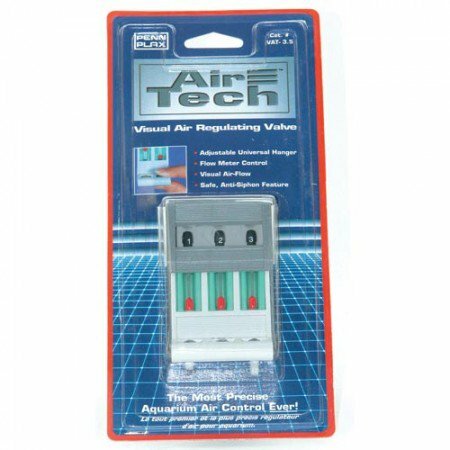 - Integrated air filter supplies clean air to your aquarium. Quick and positive action in any position. Polypropylene valve is highly resistant to chemicals and temperatures up to 100°C (212°F). 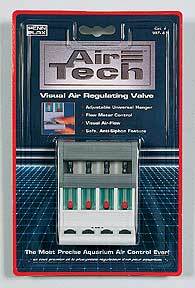 Use for any pressure or vacuum system. 228225 will fit tubing 8-9-10 mm (1/4″ - 3/8″ I.D.). Overall length 2-1/2″. 228215 fits tubing 11-13-15 mm (7/16″ - 5/8″ I.D.). Overall length 2-3/4″. These polymer check valves have no springs. Use for fresh water, salt water or air. Make excellent foot valves with low pressure loss. 1/2 lb stainless steel springs (about 20" H2O resistance) are available for more positive closure for 45¢ more per valve. Made in USA. Add "85" to the end of the part number to include springs (except CV5). 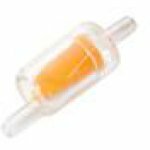 These emitters have an infinite adjustment up to 2 gph, and screw in with a 10/32" thread. The emitter screws into the riser tube or 3/16" tubing. 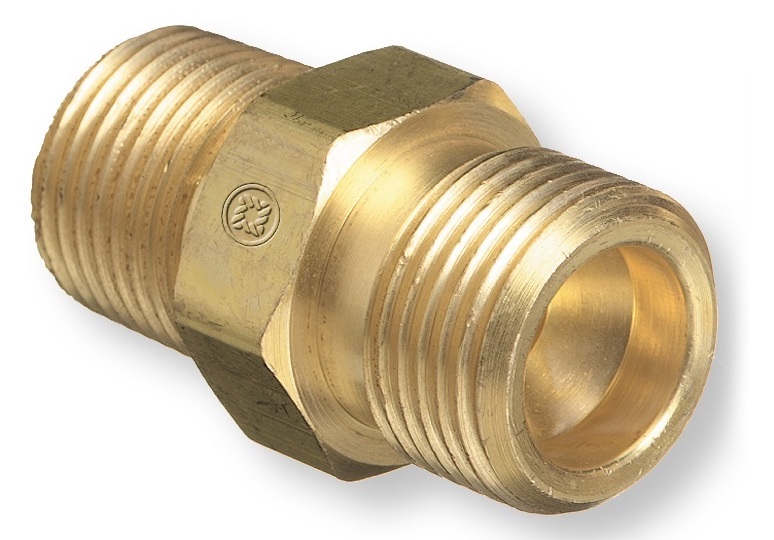 Expansion plugs are suitable for all low- and medium-pressure water applications. A simple twist of the wing-nut will produce a watertight seal. 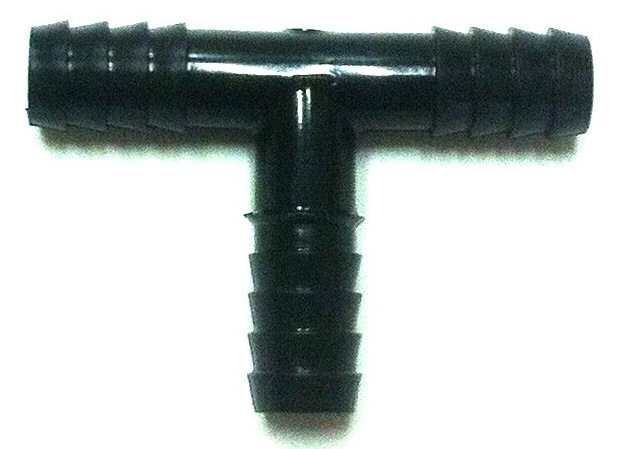 The 1-1/2", 2" and 3" plugs fit the end of pipes only. The 4", 6" and 8" plugs can also be inserted into the pipe. Why use an expensive bulkhead when you can use a Uniseal®? Just drill a hole in the pipe, tank or bucket, insert a Uniseal®, then put some window cleaner on the end of the pipe and push it in. It's that easy! 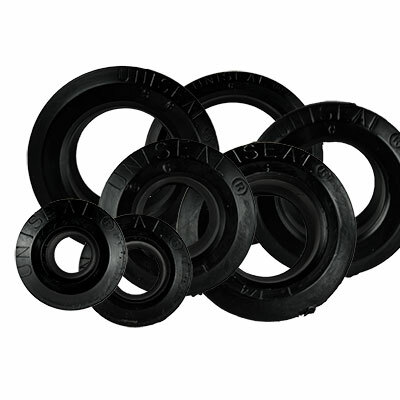 Feel like rubber, but they are made of DuPont Alcryn® rated to 40 psi and warranted for 25 years. They are immune to cold, will not harden and hold pressure and vacuum. The sizes below correspond to standard Schedule 40 PVC pipe. Fit tank wall thicknesses up to 1/2". Made in USA. Here is a hard-to-find, cost-saving fitting. Just drill a hole, press in a tee eliminator, then thread in your pipe. Made of flexible PVC with female pipe threads. They work in all rigid pipe materials with pipe walls between 1/8" and 1/4" thick (use holesaws). Made in USA. FC32: FNPT Size 1/2", Mimimum Pipe Diameter 1", Hole Size 1"
FC34: FNPT Size 3/4", Mimimum Pipe Diameter 1-1/4", Hole Size 1-3/16"
FC36: FNPT Size 1", Mimimum Pipe Diameter 1-1/2", Hole Size 1-7/16"
On the floor, wall or overhead, these neat plastic hangers will make the job go fast and look great when it's done. After all the hangers are attached, push pipe into the open jaws, and a sharp "click" signals that it is locked in place. They also release easily. Meets UPC (Uniform Plumbing Code) specifications. Sizes below fit PVC, CPVC, ABS, PE, PP, PB and fiberglass pipe nominal sizes. Temperature range: -40 to 180°F. Reusable. These quick ratcheting non-corrosive clamps work very well on vinyl tubing. They tighten by hand or with pliers and are releasable/reusable. Not for high pressure applications. Black color. UV inhibited. For use in corrosive environments. Marine, Food, Agricultural and Industrial Applications. 301 SS Band and 305 SS Screw. Made of polyester (PBT), which offers permanent rigidity and stiffness even in high humidity areas. Infinite variable flow. Easy one-hand operation. No metal parts. Excellent chemical and temperature resistance. No corrosion. Ideal for continuous, long term use for air or water. 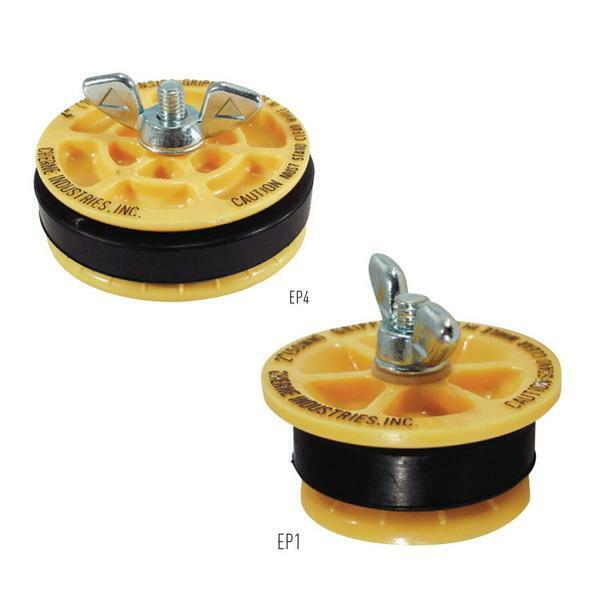 Non-slip wheel. Autoclavable to 320°F (160°C). Manufactured of tough plastic without sharp edges. The DC9 is an On/Off valve only. The DC10 and DC11 have a 12-position ratchet control. Accurate and economical. This autoclavable screw clamp provides fine control that can replace stopcocks. Hinged sides allow for installation without disconnecting the tubing. 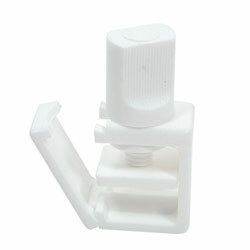 Accepts airline up to 1/2" (13 mm) O.D. Sold individually. 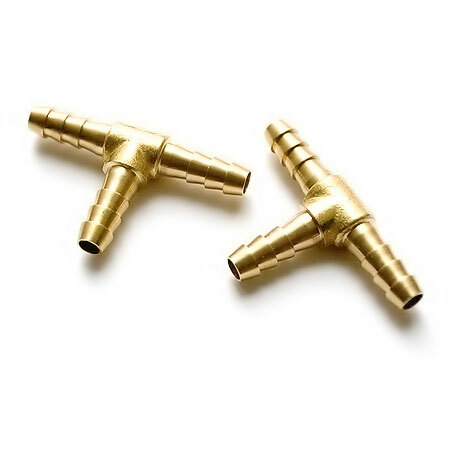 These high quality brass adapters will work at high temperatures to 150 pounds per square inch. Note: Thread sizes are nominal (1/2″ = 0.62″ actual). Brass Construction. Threads conform with the American standard taper pipe thread & resist vibration. Tighten a minimum of 2-1/2 turns after hand tightening for air tight seal. Brass Female Swivel Ball Seat Fitting. 1/4"" HB x 1/4"" Female Swivel (Ball Seat). 2 Piece. 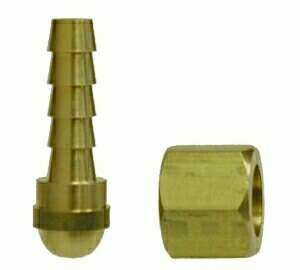 Brass Female Swivel Ball Seat Fitting. 1/4" HB x 1/4" Female Swivel (Ball Seat), 1/4" Male NPT Adapter. 3 Piece. 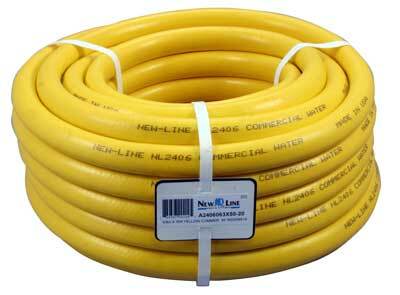 Yellow commercial water is lightweight, high visibility PVC hose that is commonly seen in parks, greenhouses and other agricultural settings. Each length is coupled with heavy-duty brass garden hose couplings. Working Pressure 125 psi. Multi-Purpose rubber hose is a traditional hose used across many industries. The rubber will remain more flexible over time as compared to PVC hoses, especially in colder environments. Its cover is resistant to light/medium abrasion, ozone, and weathering. Working Pressure 200 psi. 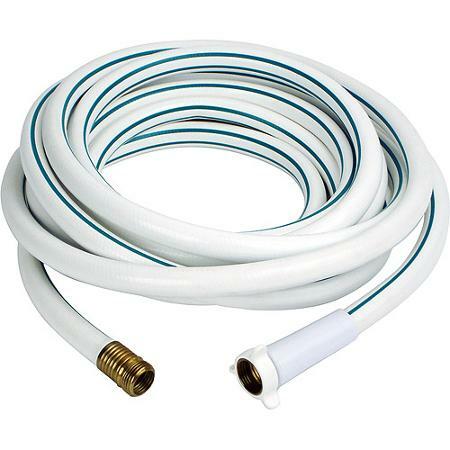 White marine water is a lightweight, PVC hose. Its FDA, non-toxic tube makes it suitable for drinking water. 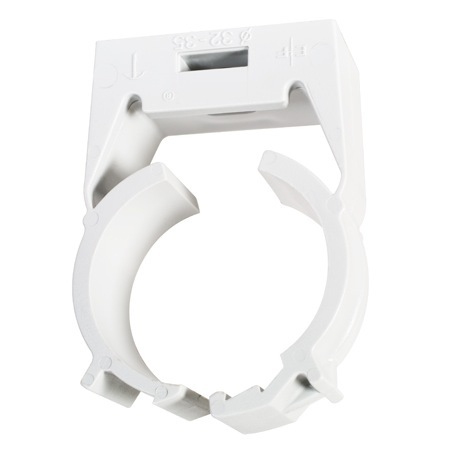 Each length is coupled with heavy-duty white nylon garden hose couplings that will not corrode or pit. Working Pressure 150 psi for the 1/2″ and 125 psi for the 5/8″.